Supreme touch responsivity and beautiful musicality in its sonic qualities; the Aero 33 feels as if it were wired to your finger tips—but this new design takes it to an entirely new level. It takes off with searing harmonics which are accentuated as you dig in. Back off your attack or roll down your guitar volume and it responds with a gorgeous clean tone that sings with sustain and a chorus-like chime. The cathode biased quartet EL84 output section is responsible for a beautiful natural compression that supports the player. Vocal, expressive mid range, shimmery top end and a stout, resonant bottom end that makes you think big bottle output tubes are at play. The front control panel is simple and intuitive. Volume followed by a standard 3-band EQ, a presence control as well as a high cut control. The high cut control operates within the power section of the amplifier and thus allows the user to darken and shape the overall tone of the amplifier without affecting the equalization of the preamp section. This solves the common problem of the loss of gain and clarity when turning the treble control down in the preamp. While the Aero 33 has plenty of gain and natural distortion on tap, the clean tones are no afterthought and equal or best the most iconic EL84 amps that shaped the perception of what “EL84 chime” has become to mean. Complex, three dimensional sounds that envelop the player, lightning fast response to the finest nuances of touch, and an unparalleled clean to mean range are what the Aero 33 are about. 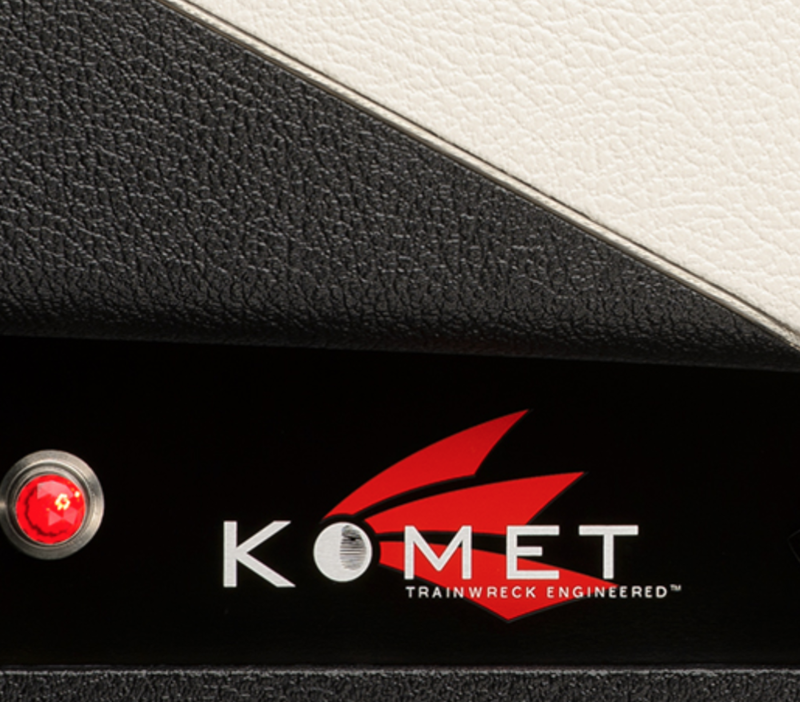 As with all Komet amplifiers, this new amplifier is sonically multifaceted and pedal friendly, no matter which guitar, pickup compliment or playing style you choose. On the back control panel you will find The Touch Response switch. This Trainwreck Engineered™ circuit enables the musician to alter the amplifier's touch response characteristics to suit their playing style. A simple flip of the switch allows the player to choose between a fast, or a gradual response to one's picking dynamics and guitar's volume control settings. The Touch Response circuit is not an extra gain stage or gain boost circuit. Instead it works by magnifying subtle changes in pick or finger attack along with subtle changes in guitar volume. This circuit allows those players who prefer clean tones to run the full range of dynamics without breaking into unwanted distortion. A blues player can play on the edge of distortion easily going from clean to blues overdrive using pick attack as the controlling factor. An over the top player can go from clean to scorch using the fast setting. The slightest change in pick attack or guitar volume setting will translate into huge changes in dynamics and power. To sum up, the Touch Response circuit lets you choose the response and feel you want and makes your amplifier capable of playing every style of music.